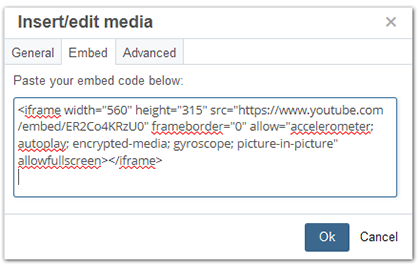 Learn how to embed a video into a CMS web page. 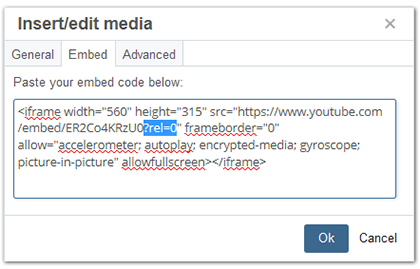 Copy the appropriate HTML code to embed the video. For this example, we'll use a video from YouTube (Vimeo also works). 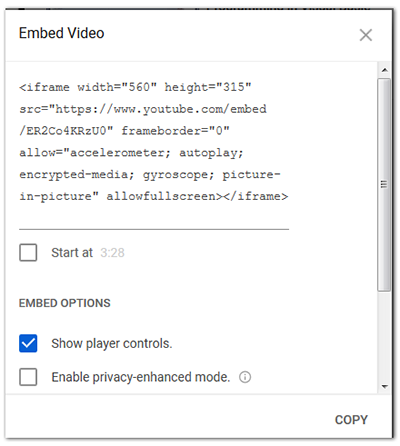 Copy the code from the "Embed" area in YouTube. Go to the CMS page you want to embed the video into. Open the Edit window by clicking on the icon. In the WYSIWYG menu, click the Insert/edit media icon. In the Insert/edit media window, click on the Embed tab. Paste the embed code into the window. Note: As of late 2018, YouTube no longer has an option to avoid showing reccomended video links at the end of your video. Instead, you should limit those reccomended videos to be just from your channel. In the embed code, find the link that follows src="
At the end of the link, add the code ?rel=0 inside the quotation marks. Click Preview Draft, as usual. Submit and publish when ready.